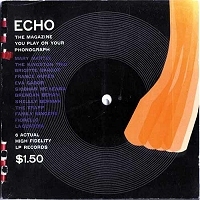 With a hole punched right through the center, ECHO magazine was a short-lived quarterly publication that consisted of interesting layouts interspersed with flexi records. 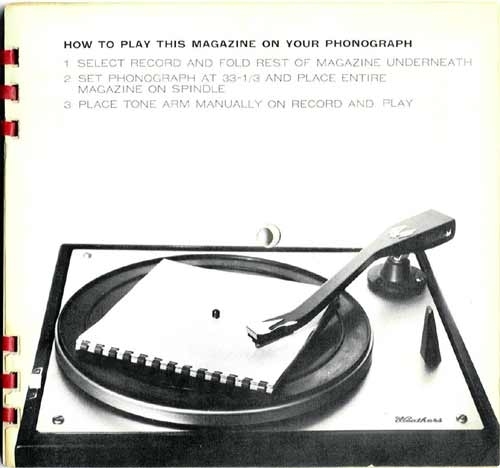 The listener would fold the magazine open, set it on the turntable and drop the needle on it to hear the recordings. 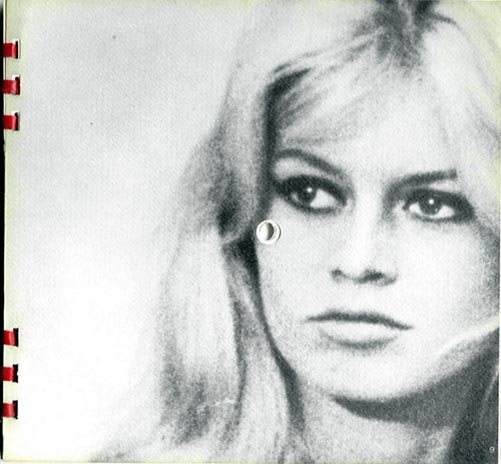 Echo neglects to mention the laughter of lovely Brigitte Bardot heard in this little audio montage trip around the world. 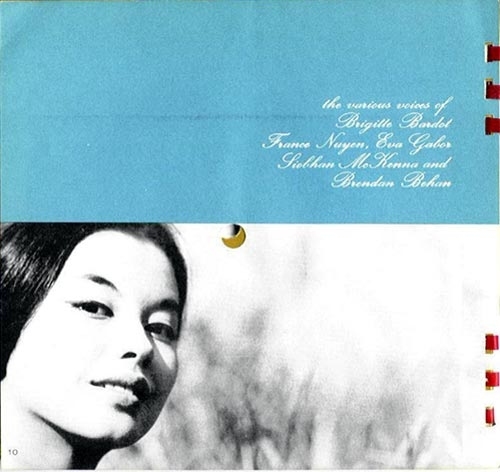 The subject of poetry took Echo's tape recorders far and wide for the record that follows: To an upper chamber of Sardi's restaurant to hear France Nuyen, Broadway's original Suzie Wong, read centuries-old Chinese poetry; to a Greenwich Village night club for the brilliant satire of poet Kennith Koch and pianist John Gruen. At the Cambridge Drama Festival, actress Siobhan McKenna discusses her role in Macbeth; from Spain, the cry of Manolo Leiva in a Flamenco filled with pathos and nostalgia; in an eastside Manhattan duplex beautiful Eva Gabor reads a love letter. 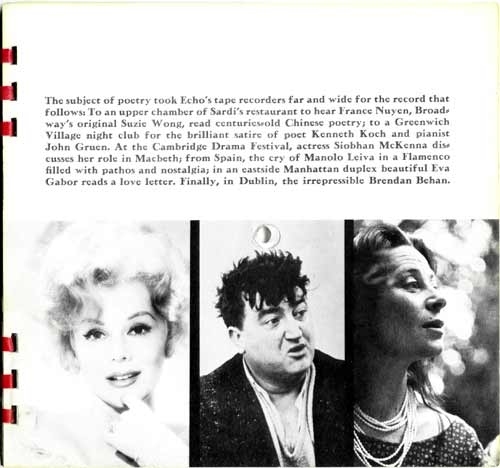 Finally, in Dublin, the irrepressible Brendan Behan. 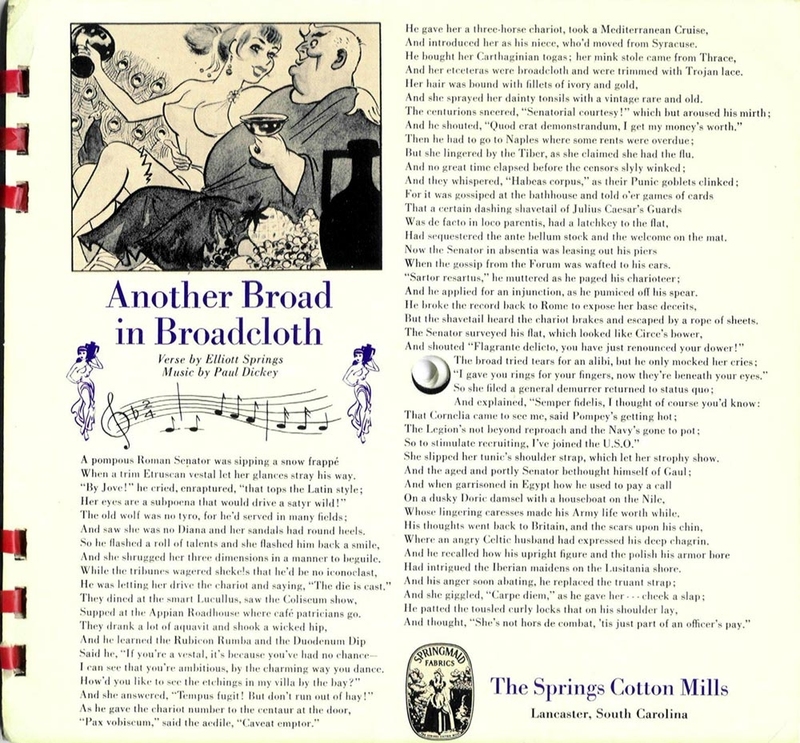 verse by Elliott Springs, music by Paul Dickey a risque little song, an "ad-divertissement" from the Springs Cotton Mills of South Carolina. 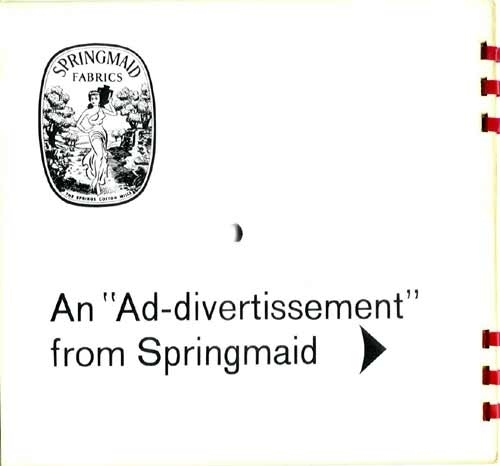 New York City's talented Designers' Collaborative did the graphics and copy, and United Artists served as the agent supplying the entertainment talent. The performers included such luminaries as actor and dancer Fred Astaire, illustrator Jules Feiffer, humor writer and illustrator James Thurber, burlesque queen Gypsy Rose Lee, comic Steve Allen, jazz greats the Ahmad Jamal Trio, artist Salvador Dali and comedians Bob and Ray. The following recordings are from volume 1 number 3 in 1960, which also featured Mary Martin with the Trapp Family Singers, comic Shelley Berman, folk group the Kingston Trio, a posthumous release of former New York City Mayor Fiorello LaGuardia [1934-45] reading the funnies, and a piece by Fiorello playwright and novelist Jerome Weidman. Wow. It's like a pre-iPod podcast! "...a hilarious discussion between Salvador Dali and Edward Mulhare (who was touring at the time replacing Rex Harrisson as Henry Higgins in the play My Fair Lady) where Dali suggests a new way of intuitively articulating familiar words to make them more interesting." Also, if you have any interest in collecting copies of ECHO, several are posted online for sale and a few are listed at Biblio, but be prepared to part with $60-$120 per copy. Yeesh. Wow... that's like the first podcast! What a shame that they didn't survive to publish their magazine in all the audio media we've gone through since then... but it certainly is fitting that they finally made it into mp3. :-) Thanks for posting this!